The must-have sales analytics to control revenue growth! Sales managers need every advantage in an increasing fast paced sales world but the volume (or lack of it) of analytical information from the company can stress even the most best sales manager. 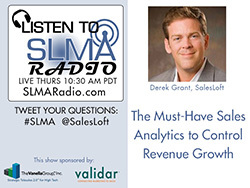 In this short interview, Derek Grant of SalesLoft takes us through the absolutely must-have-analytics that every sales manager needs to control their future revenue stream. Marketing managers are invited to listen. The host is Jim Obermayer. Derek leads SalesLoft's sales organization, which is focused on helping sales development practitioners schedule more, qualified meetings. Prior to joining SalesLoft, Derek served as the architect of Pardot’s sales process, leading the organization from pre-revenue startup to $100M exit to ExactTarget (subsequently acquired by Salesforce). Derek is a native son of Florida and holds a bachelor's degree in communications from Florida State University. SalesLoft is the simplest way to convert prospects into qualified appointments. Build a cadence of phone calls and sales emails for your team to follow consistently. Automatically track and log sales emails and dials into Salesforce, saving time for Sales Development Reps to have more conversations with our integrated sales dialer.